Mood board: Solemn as a mass funeral and yet as intriguing as any complex work of contemporary art, Rei Kawakubo sent out another fashion collection that took root around her preferred themes of exaggerated volumes as well as fabrics that had been twisted, tied and inflated to look like bulbous forms. The human body, including protruding heads and scarecrow legs, were but mere after-thoughts to the larger mental exercise of recasting fashion norms. Best in show: As usual, there was much to marvel at here. Kawakubo played with ruffles, ornate pleating and oversized ribbon lacings that took their cues from fairytales or the Victorian age. But the best work centered around her use of feathers, including piles of brown and white coq plumes that were built up to look like beautiful bird nests and the huge velvet casings that looked like tree trunks cinched with leaf-like feathers. Finishing touches: In the world of Comme des Garçons, the models’ hair is treated with as much artistry as the clothes. 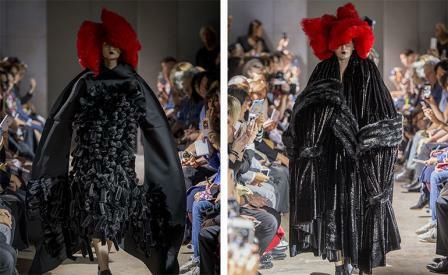 This season Kawakubo made the case for blood red cotton candy hair sliced into wedges along with a few feathered head dresses that swallowed the model’s heads completely, save for a couple of handy eye slits.